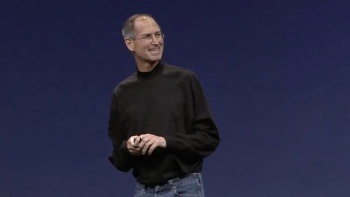 Apple's Steve Jobs Announces the "iPad"
Like Moses coming down from Mt. Sinai, Steve Jobs descended on the geeks of San Francisco bearing the iPad, a bigger version of the iTouch. The much anticipated tablet computer from Apple has some pretty impressive specs. It weighs 1.5 pounds, boasts a 9.7 inch multitouch (duh) screen and an "Apple A4" processor. The 1 ghz Apple A4 chip was custom made for the iPad using the proprietary P.A. Semi technology. Apple claims the iPad will get 10 hours of battery life when actively used or a month on standby. The iPad has a 3G connectivity deal with AT&T for $14.99/month limited to 250 MB, or unlimited for $29.99, or you can opt for pure wireless internet or Bluetooth. The iPad is priced at $499 for a 16GB, 32GB for $599, and $699 64GB, but if you want 3G capability, you have to pay $130 for it. The most expensive model then would be $829, a 64GB with 3G. The iPad will ship in 60 days, with the 3G versions coming in 90. The iPad has a soft touch keyboard built-in which Steve Jobs says is "super responsive, super precise." More from Jobs, "[The iPad is] way better than a laptop, way better then a phone. You can turn it any way you want. To see the whole page is phenomenal." The iPad runs all iPhone or iTouch apps (in a window or at double-size) but Apple also announced a version of their office suite, iWork, for the new device. A new SDk was released today so that third party developers can update their apps to take advantage of the bigger screen, or write new apps altogether. Games on the iPad are alive and well, with Apple showing off the iPhone versions of Gameloft's FPS N.O.V.A and an updated EA's Need for Speed: Shift. With the new SDK out today, it's only a matter of time before game designers take advantage of the iPad. The killer app of the iPad is iBooks, which is poised to turn other electronic readers into Kindling. With deals with major publishing houses like Simon and Schuster and Penguin, many people will turn to downloading iBooks for $12.99 to $14.99.